I am so excited to introduce my new blogging gal pals in our monthly series, launching January 2017, called Bluff City Lights. Each of us have a vested interest in the city of Memphis, in particularly small business, fashion, beauty, and lifestyle. We would like to invite fellow bloggers to link up in our monthly post topics and encourage our followers to enter into our monthly giveaways. Now introducing….The BCL Fashionistas. 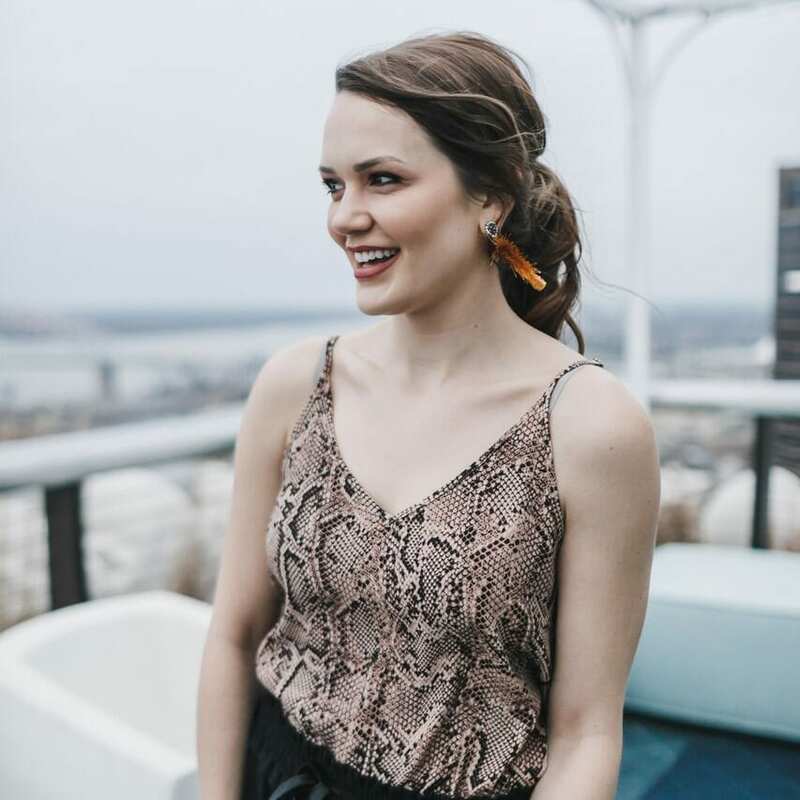 The fashion blogger behind Living LeReve, Mary Conley, earned her bachelors in Biology from The Ohio State University. Spending her whole life in Ohio she moved to Memphis, TN upon graduating to be with her boyfriend. She worked at fashion boutiques while she figured out which career she wanted. During that time she discovered people around her were interested in what she was wearing and the idea of starting a fashion blog came to life. Mary starter her styling career while working at boutique and developed a relationship with clients outside of the shop. Her main focus was styling woman and editing their closets until she got the opportunity to style two players of the Memphis Grizzlies. Currently a board member of Memphis Fashion Week she helps plan and organize the week long event while assisting in styling the models through out the shows. As of November, Mary became the stylist and fashion coordinator for Click Magazine. Now married and a new mother to her 4 month old son, becoming a stylist has been her main focus after realizing how much she loves transforming peoples looks. Megan was born and raised in Kentucky and attended the University of Kentucky graduating with degrees in Psychology and Political Science. She then attended law school and soon discovered that the idea of contracts and property law did not seem as exciting as she once thought, so she dropped out, packed her bags and headed for Memphis, TN where her, then boyfriend now husband, is from. Megan loves fashion, beauty, travel, and Netflix, not necessarily in that order. She is a working gal who does the 9-5 and blogs at nights and on the weekends. Her blog, Pretty in Pink Memphis, has been around for over 10 years beginning as a wedding blog but evolving into lifestyle and fashion. Collins earned her Bachelor’s degree in Broadcast Journalism from the University of Mississippi. An exceptional student and influential role model on campus, she was the President of the Student Alumni Council, President of Student Spirit Committee, an Officer for the Kappa Delta Sorority, and an Ole Miss Varsity Cheerleader. A gifted musician, Collins has played the piano since the age of six. Alexandra wears many hats in her home and career life, she is first and foremost a mommy and wife, with entrepreneurship being her skilled trade. She works as a multi-business owner of The Ivory Closet boutique brands and corporation, The Attic Apparel, and Adel Amor Cosmetics, as well as a makeup artist, published fashion stylist, blogger, and business consultant. She launched her blog City Chic Living to share the most current fashion and beauty trends that she observes on her travels to market and Fashion Week, her latest published fashion shoots, health and lifestyle challenges, interviews with fellow entrepreneurs, and other “mom stuff”! Alexandra is a graduate with a Masters in Business and Administration from the University of Memphis and has also studied International Business at Bournemouth University in Poole, England. Alexandra has dedicated her work to the empowerment of women via entrepreneurism in our city and it’s surrounding economies through fashion, beauty, and lifestyle initiatives. She believes in the support of the church, small businesses, and, of course, the American Dream that our country was founded upon. Bluff City Lights was inspired by a quote from Les Brown, “You don’t have to be great to get started, but you have to get started to be great!” The four of us have a desire to accomplish several things through Bluff City Lights, such as seeking out like minded women in Memphis who enjoy fashion and it’s latest trends, building a blogging, fashion, beauty, and lifestyle network within our community, encouraging the Mid-south to feel confident in their style and with the freedom and fun of fashion, promoting self confidence in others, and sharing our experiences and support of small businesses and other makers. Be sure to follow each of our blogs so that you are notified of our first big fashion collaboration and giveaway with The Ivory Closet launching January 2017!